Do I Seriously Have To Hang A "Do Not Flush Tampons" Sign In My Bathroom? I live in a 2-bedroom apartment built sometime before 1945 (there is a total of 3 or 4 units), and have been there for about two years. My landlord lives in the same building. My landlord has started calling me once or twice a week to tell me how I have cause the problem and how stressed I am making him. I’ve been told I am using too much toilet paper, that grease has been leaking out of the pipes when the plumbing backs up, and other disgusting things that I’d rather not include. 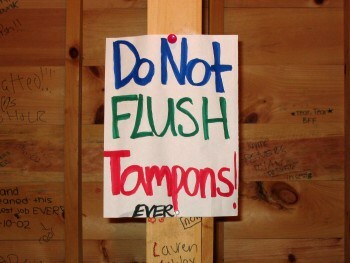 Recently I was told to hang a sign in my bathroom that stated “Do not flush tampons”. I told him no, but can they request or force me to hang signs like that? And am I at risk for losing my entire deposit because they believe I have ruined the plumbing system for this building? This is being directed solely at me, not at anyone else in the building. My landlord also came by to ask about my new roommate, and it wasn’t until after he weaseled his way in, he began to “inspect” my appliances, floors, and walls. I feel like this was a bait and switch and perhaps not at all a legal inspection? So, is this completely legal and part of the downside of renting? Or am I being pushed around a little too much? This is another “Renting Adventures” absolute: According to landlords, tenants always cause the plumbing problems in a building. Never mind that the plumbing dates back to the time of the Roman aqueducts or that the last time someone called Roto-Rooter was in 1956. Several years ago we defended a case in which the landlord, with a straight face, claimed that my clients, who put spaghetti in the garbage disposal, caused the sewer backup. Are you being pushed around a little too much? Sweet Jesus, there’s the understatement of the day. As I said, you’re dealing with a troll. It’s time to go Frodo on him. First, no more phone calls. You must tell the landlord, in writing, that you will no longer speak to him in person about your tenancy. If he has something to tell you he must state it in writing. An email is fine. Second, tell him (in writing) to stick his sign where the sun doesn’t shine. There isn’t a law anywhere that allows a landlord to require signage in a residential dwelling. Third, point out that the landlord cannot simply weasel his way in for an inspection. He must give you a 24-hour notice to enter that states one of the legal reasons to do so. Finally, the landlord might try to keep your deposit, but there’s no way in hell that he can prove that you caused the plumbing problems. See above. In fact, if the plumbing is backing up into your unit, you should write the landlord a letter and request that he repair the plumbing. If he blames you again and refuses to call a plumber, call a housing inspector at the Department of Building Inspection to make a complaint. Finally, is this simply a downside of renting? Yes, it’s a downside of renting a unit in a building in which the landlord resides⎯a situation to be avoided at all costs.